This article first appeared in Corporate, The Edge Malaysia Weekly, on July 25 - 31, 2016. 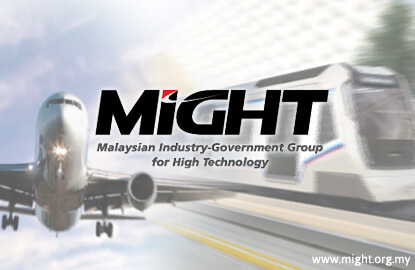 MALAYSIAN Industry-Government Group for High Technology (MIGHT), which is a unit of the Prime Minister’s Department, is in the midst of preparing a White Paper on how local rail companies can benefit from the large number of rail-related jobs being dished out and participate in the projects. The plan is for MIGHT to present a proposal as a White Paper to the Ministry of International Trade and Industry and Malaysian Investment Development Authority to make rail a priority sector and provide incentives for rail human capital development. A consortium, dubbed the National Railway Industry Consortium, will be established and presented to the Economic Council. It is understood that on July 1, MIGHT met with industry players — Keretapi Tanah Melayu Bhd (KTM), MyHSR Corp Sdn Bhd, Prasarana Malaysia Bhd, Mass Rapid Transit Corp Sdn Bhd, Express Rail Link Sdn Bhd (a 50% unit of YTL Corp Bhd), publicly traded Scomi Engineering Bhd, Emrail Sdn Bhd, which is taking over the listing status of Premier Nalfin Bhd, privately held Global Rail Sdn Bhd, Hartasuma Sdn Bhd, System Consultancy Services Sdn Bhd and its unit DK Composites Sdn Bhd, SMH Rail Sdn Bhd, Majestic Engineering Sdn Bhd, PSI Incontrol Sdn Bhd and Artic Rail Group Sdn Bhd — in its office in Putrajaya and sought to understand why local companies lacked the expertise to bag rail jobs in the domestic market. “Some of the companies, such as Scomi (Engineering), have won contracts in Brazil and India but are not seen winning jobs locally … this has caught the attention of the government. So, the plan is to form a consortium and make us more competitive,” says a source. While they were present at the meeting, it is unlikely that the asset owners, such as government-owned KTM and Prasarana, will play a role in the consortium. MIGHT president and CEO Datuk Mohd Yusoff Sulaiman is understood to have talked about The Society of Japanese Aerospace Companies (SJAC), established to represent the interests of that country’s aerospace industry. SJAC is a non-profit trade association whose members are Japanese enterprises that manufacture aircraft, engines and equipment related to aviation and aerospace. Other examples were also cited at the meeting. In South Korea, rail company Hyundai Rotem Co had started out in 1999 as Korea Rolling Stock Corp, which was a merger of Hanjin Heavy Industries, Daewoo Heavy Industries and Hyundai Precisions and Industries, and was renamed Railroading Technology System (ROTEM) in 2002 and Hyundai Rotem in 2007. Similarly, China National Railway Locomotive and Rolling Stock Industry Corp (LORIC), a government-owned entity, was established in 1986 and in 2002, it was separated from the Ministry of Railway. It became China South Locomotive and Rolling Stock Industry (Group) Corp or CSRG before morphing into China South Locomotive & Rolling Stock Corp Ltd or CSR in 2007. Its competitor, China Northern Locomotive and Rolling Stock Industry (CNR), was formed in 2000. In 2015, CSR and CNR merged to form China Railway Rolling Stock Corp (CRRC). “It was basically a session to gauge our (the industries’) strengths and what we are capable of doing and what we can request from the government in terms of work and, most importantly, why the local companies do not secure rail jobs here,” the source says. And rail contracts are very much in vogue now. Just last week, the Malaysian and Singaporean governments signed a memorandum of understanding on the construction of the multibillion-ringgit High-Speed Rail, which will span 350km and link the two countries. There is also talk of a multibillion-ringgit Pan Asean Rail Transit, connecting Kuala Lumpur to Bangkok in Thailand and going on to Kunming in China. Other proposals include one by China Railway Construction Corp to build a passenger and freight railway line linking Kuantan to Bangkok but there are scant details. An East Coast Rail Line has been mooted as well, to connect Kuala Lumpur to Mentakab, Kuantan, Kuala Terengganu, Kota Baru and Tumpat on the east coast of the country. And many light rail transit, mass rapid transit and monorail jobs are being dished out, which would add up to billions of ringgit. According to MIGHT, since the 1990s, the government has invested more than RM100 billion in rail infrastructure. And with the investment ratio split at 70% for infrastructure works and 30% for systems, it is safe to say that systems have cost the nation in excess of RM30 billion since the 1990s with our strong dependence on foreign original equipment manufacturers. With strong demand for rail services and related jobs, the consortium is expected to venture abroad as well and win contracts. According to MIGHT, the world’s rail and transit industry will be worth US$240 billion (RM972.61 billion) by 2020 while in Asean, there will be a need for 1,100 new carriages and refurbishment for another 700 in the next five years. Similarly, there are rail jobs worth around RM55 billion in Saudi Arabia and RM45.9 billion worth of monorail jobs in India. Monorail jobs in Turkey and Saudi Arabia alone could be worth RM9.5 billion. While the rail players seem pleased at the opportunity to secure more jobs, some of the government officials have asked for an honest and credible provision of information — due diligence to determine the strengths and weaknesses of the local players and why they have not been awarded local contracts — before a presentation is made to the government.